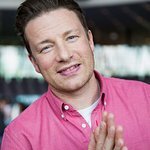 Famous for trying to get Americans and Brits off processed foods and into eating healthy, celebrity chef Jamie Oliver has written a new cook book that highlights a brighter side of the state of American cuisine. Oliver: I personally believe that is fake food. Anyone want a piece? “There’s nothing wrong with pizza, burgers, nuggets. They can be wonderful foods. It’s just that very often these days the processed, convenience versions actually don’t have that much meat in; they’re sort of thinned out with all sorts of things from mechanically reclaimed meat, extra skin and fat, and then 40, 50 different types of additives and flavourings and kind of stabilizers. That’s the kind of stuff that winds me up. “Even in schools in the States, the milk board somehow gets through the net and they advertise all their flavoured milks, so even the virginal milk now in the States has been adulterated with flavourings, colourings and 26 grams of sugar. [In the UK] we’ve never ever had milk laced with as much sugar as cans of soda, and they get two a day for 180 days of the year from the age of 4 to 18. And then they kind of wonder why they’ve got a problem with diabetes. “[The Jamie’s America cook book] is more of a state of mind really, kind of getting off the beaten track and asking the right kind of questions to locals. From the Navahos of Arizona to, I was looking at Cajun food in Louisiana, New Orleans. It was just fantastic. We were in Georgia just after Obama got in. We were also doing soul food. Down to Savannah, which couldn’t be more kind of French-English stay. We were in east LA, Mexican gangs with some interesting projects inspiring ex-criminals. But really, ultimately, getting under the skin of real food. The States is a new country, which is a melting pot of different ages and of waves of immigrants. What that means is it’s very exciting.